hirty-four years after the Portrait of Christ was painted in New York, I was asked to create a second portrait of the Lord Jesus for the Noroton Presbyterian Church in Darien, Connecticut. Noroton Church was building a large new fellowship lobby, and the portrait would hang in an alcove between this large entrance hall and the main sanctuary. 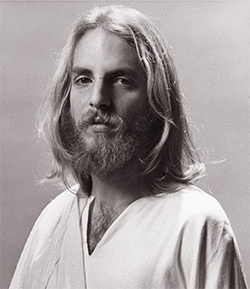 Two images of my model from the 1980 Portrait of Christ: NYU student Jay Friedken. I altered the pose of the hands to create a welcoming gesture. 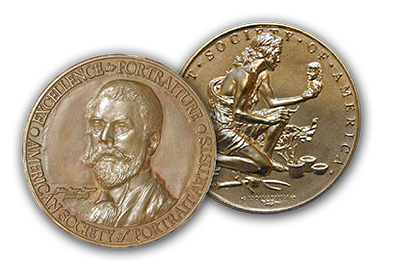 I returned to the file of photographs created for the 1980 New York portrait, and found the two pictures shown here (to the left). Pastor Samuel Schreiner suggested, as an appropriate background, the shoreline of the Sea of Galilee, which figures in so many of the Gospel stories. 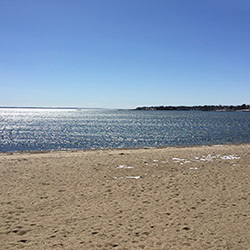 Noroton Church conducts summer worship services on the shore of Long Island Sound, which (see photo at upper right) bears a striking resemblance in Darien to certain views of Galilee. "One day as Jesus was standing by the Lake of Gennesaret (Sea of Galilee), with the people crowding around him and listening to the word of God, he saw at the water;s edge two boats, left there by the fishermen, who were washing their nets. He got into one of the boats, the one belonging to Simon, and asked him to put out a little from the shore. Then he sat down and taught the people from the boat. "Come, follow me," Jesus said, "and I will make you fishers of men." bear a striking resemblance to the Sea of Galilee. 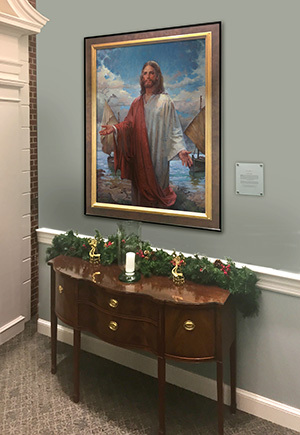 The Noroton Portrait of Christ hangs in an alcove between the churchÃ¢â‚¬â„¢s new Fellowship Lobby and the entrance to the main sanctuary.